Marlie is back to her smiley, playful, and cooing self! I take this as a good sign that she has recovered from whatever it was that got into her system. She has her two-month check-up next Monday, so I will have Dr. Agrawal make sure. I hate that she has to spend her first delicate months at the height of cold and flu season. Her mommy is taking extra precautions to protect her little immune system though. She attended her first party on Saturday, a co-ed baby shower for our friends Brandy and Brian. She was dressed to impress and received lots of attention! We took her for a walk with one of our neighbors on Wednesday evening . On Thursday, Marlie and me walked to a baby store the arts district where I bought her a Taggies toy. On Friday, we had lunch with a friend of mine and ran some errands. She has a busy social calendar! We went to Babies R Us after the baby shower to check out some strollers and buy her some winter clothing. Marlie decided this would be the perfect opportunity to have her first public blowout, which leaked onto her pretty outfit because someone didn't put her diaper on correctly (no need to I.D. the guilty party, *cough*). Luckily, I was holding her and my hand caught most of the poo before it could do further damage. I called her daddy to join me in the "mother's room," which I take is reserved for nursing mothers, but I was in no mood to follow rules because the Exxon Valdez spillage in her diaper needed two sets of hands to clean up! Boy, did it stink up that room! Needless to say, we abandoned our stroller shopping, quickly paid for our other purchases, and beat a hasty retreat. Everyone is amazed by her strength. 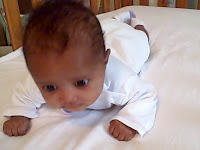 She can keep her head steady for minutes at a tim e and turn from side-to-side when she is being held, and she is a pro at tummy time. Watch girlfriend fuss then decide to give it the ole' college try. See how she sticks out her tongue as she exerts effort? Look at those legs go! Listen to her grunt in triumph and her mommy's cheer! She is destined for the Olympics, I tell you! Little Miss Grabby Hands got a hold of a handful of mommy's locs and would not let go! I had to pry open each finger to undo her vice grip. She really is strong! She has also been scratching her face signaling that it's time to clip those nails and put on some mitts. Marlie has started drooling a lot and going at the back of her hand like it's a Popsicle (her mama loves Popsicles) prompting people to ask if she is teething. Huh? A two-month-old with teeth? That would be one for the record books! The whole reflux business has really thrown off her eating and sleeping. Her tummy was so upset that I have had to give her smaller feedings every 1.5-2 hours. She has been building back up to her regular appetite, but she's still not sleeping well. It's easy to get her to sleep, but she'll only stay asleep for 30-45 minutes at a time. I've been trying the 31 Ways to Get Your Baby To Go To Sleep And Stay Asleep Easier with mixed results. I tried playing a Mozart CD while nursing her in hopes it would lull her to sleep. She suddenly started to pout and whimper. I thought it was a bad latch...nope. I thought maybe there was no milk on that side, so I switched...nope. Her whining turned into a full-blown wail, and I was helpless. I quickly Googled "baby whimpers while nursing" and clicked a Yahoo! Answers link. One of the responders indicated that playing music was while feeding the baby could be the problem. I turned off the CD player and, voila, she stopped crying. I am truly mystified! I guess Mozart makes her emotional. Marlie is a contestant in the Cutest Baby Contest at the blog Baby Makin(g) Machine. She has been holding a slight lead all week. It's time to clinch it! Please swing over there and vote for her. The ballot is on the left side toward the bottom (you have to scroll a bit). Just select #8 (that's Marlie) and hit the VOTE button. Takes 5 seconds. Voting ends tomorrow at 11:59 pm. Thanks for your support! Loving reading about gorgeous Marlie, she is very very pretty and seemingly strong and clever too. Go Marlie. I laughed when I read that you googled and then excluded Mozart . . hahahaha!!! Love reading about your new motherhood. The sincerity and love just flows off the page and gives me such sweet memories of when I was a young mum. 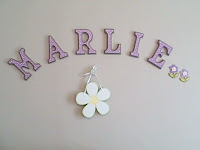 Have already voted for Marlie in the contest and am looking forward eagerly to the results tomorrow. Go Marlie!!!!! I voted! And I'm also thanking you for the bloggy bling over at my place today. Thanks again, and good luck! That stinks about the camera, but you will love it when you get a new one. We had a similar situation when Leah was a few months old. Not only did we get a new point-and-shoot, but last year we added a digital slr camera to our arsenal. Now that Leah moves so fast, the point and shoot wasn't keeping up with her! As far as the teething goes, it is a loooong process. We have some friends' babies who cut the first tooth at 4 months. Others (Leah included) didn't cut the first one until 10 months. The drooling & chomping parts kick in way before that first tooth pops through. After that, it will come and go for more than 2 years as the rest of them come in. Glad to hear you girls are finding it easy to get out and about! Enjoy this early time before Marlie starts demanding regular nap times at home! Love the pic, but I really love the video! You have inspired me...I'm going to have to make a video. Between Marlie's cuteness and Yaya's antics in videos, I need to join the throng!! !